If you study the way Hahn arranges her evidence, and examine the way she dresses it up rhetorically, it may ring a bell. You may discern a familiar pattern at work and, especially if you are a liberal-enviro-type who knows stuff but would love to have an excuse/justification/WSJ verification for eating beef, you may eventually find yourself slightly queasy by the creeping (and, actually, creepy) realization that the pattern at work is one that has been brilliantly honed by none other than: global warming deniers. Read Actually, Raising Beef Is Good for the Planet. Let’s all catch our breath before proceeding to the main point I’d like to make about this op-ed. We know things, right? Like, empirically. We’ve known since the 1960s, empirically speaking, that beef production wreaks substantial ecological havoc on our limited natural resources and we know that, since then, since the population of humans has doubled, that, viz empirically, it’s not only factory farms that cause the trouble, but even small grass-fed operations run by good-looking environmentally conscious “stewards of the land,” and we know this because very serious research has shown that not only is grass-fed beef ecologically damaging but it can be worse so. To repeat, we know things. Even if not a rancher or a scientist or lawyer, we know them. Ms. Niman sort of—it’s there, read the tone—mocks those who know things. She draws our attention to critics who worry about “ bovine burps, flatulence and even breath for climate change.” That, folks, is pure-grade, first-order-Fox News industry-strategizing for spinning the science to make its followers seem like ditto-head nitwits who believe anything you tell them to confirm a bias. But what’s really real here? Those farts and burps and deep bovine exhalations might sound silly—but, unless I’ve been led by the nose into a hall of mirrors by four decades of good science—they matter. Live animals are resource intensive beings. They breath and burp and pass gas. Methane, anyone? Niman eventually gets there, assuring us that there are ways to mitigate methane’s impact and that, rest assured, how to do so is “now under vigorous study by agricultural colleges around the world.” Well. One thing that I’ve learned over a decade of writing about this stuff is that it’s important to be charitable. Of course, deep down I want to be as right as anyone. I want the evidence to fit my bias as much as the next op-ed scribbler. But I now work more than ever before to be charitable, fair minded. That said, I simply cannot find a way to reconcile Hahn’s—again and again, a rancher’s— opening plea for us to thumb our nose at deep conventional scientific wisdom and then spend the rest of the article asking us to trust the science she has spelunked from netherworld caves of research, science that serves her financial bottom line. Which takes me to my big point. If you study the way Hahn arranges her evidence, and examine the way she dresses it up rhetorically, it may ring a bell. You may discern a familiar pattern at work and, especially if you are a liberal-enviro-type who knows stuff but would love to have an excuse/justification/WSJ verification for eating beef, you may eventually find yourself slightly queasy by the creeping (and, actually, creepy) realization that the pattern at work is one that has been brilliantly honed by none other than: global warming deniers. Yeah, those people. And this is my big problem with Hahn’s op-ed. 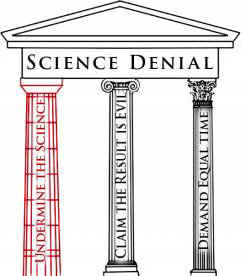 It is, in its rejection of science such as that summarized here and reified by thousands of other studies, it engages in the populist politics of distrust, a weird and very American sort of suspicion-mongering that has caused immense damage to public discourse and the enlightened policies it can, in moments of clarity, engender.